Since the deal was completed in 2015, Iran has restricted its nuclear activities and allowed for far more extensive monitoring and verification. Six reports of the International Atomic Energy Agency (IAEA) show that Iran is meeting its commitments under the deal. In return, Iran is benefiting from U.S., EU, and UN sanctions lifted by the accord. While there have been some minor issues over the course of implementation – Iran slightly exceeded the heavy water limit twice in 2016 – the deal is working. In addition to blocking Iran’s pathways to nuclear weapons, the deal is also paving the way for much-needed cooperative work to enhance the safety and security of Iran’s peaceful nuclear activities, a benefit shared by the entire region. While the timeline for completing the Iran policy review is unclear, the United States is approaching another internal deadline for the Iran deal. As required by the 2015 Iran Nuclear Agreement Review Act, the administration must certify to Congress every 90 days if Iran is in compliance with the agreement. The administration issued its first certification April 18, and the next is due around July 17. The second anniversary of the Iran nuclear deal is a good time to recall the successes of this monumental achievement. The deal, concluded after years of diplomatic fits and starts, peacefully resolved one of the world’s most vexing diplomatic challenges, the threat of an Iranian nuclear weapon. More importantly, the deal is still working. Pursuant to the agreement, the IAEA has verified Iran’s commitments in six quarterly reports since the deal’s implementation. UN Secretary-General Antonio Guterres recently praised Iran’s “full and effective” adherence to the agreement. Yet despite the deal’s continued success, its future remains uncertain. U.S. President Donald Trump has called the JCPOA “the worst deal ever,” and his administration is currently conducting a review of its Iran policy, which will include assessing Washington’s adherence to the deal. Significantly increased the time it would take Iran to obtain the material for a nuclear weapon. Iran’s breakout time, or the time it would take to obtain enough fissile material nuclear weapon, was estimated at two to three months before the nuclear deal. It is now more than 12 months. Reduced Iran’s stockpile of enriched uranium by 98 percent, capped it at 300 kilograms, and limited Iran’s uranium enrichment to 3.67 percent uranium-235—well below the 90 percent required for a nuclear weapon. 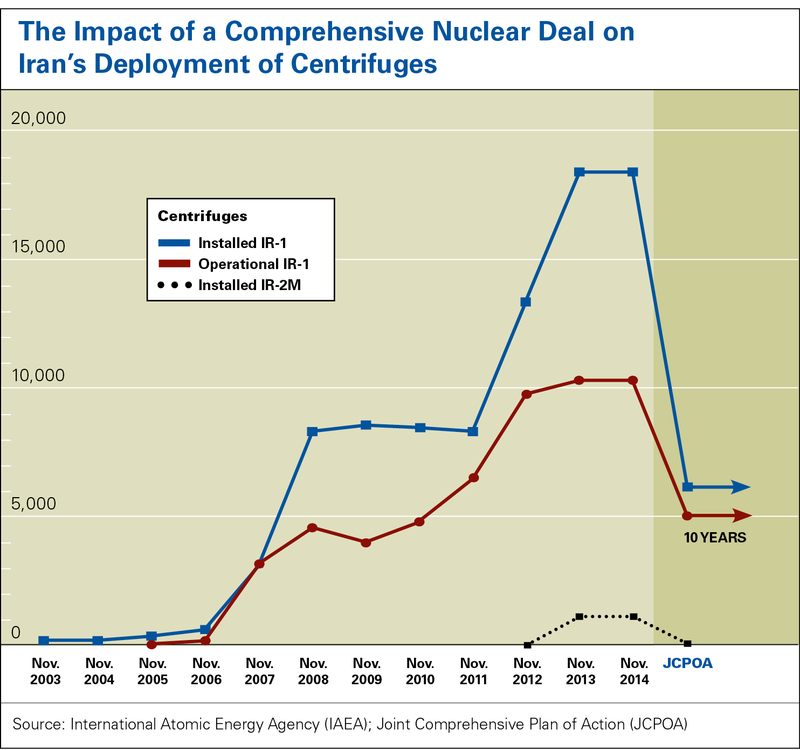 Dismantled more than 13,000 centrifuges and placed them under IAEA monitoring. Iran is only permitted to enriched uranium with 5,060 IR-1 centrifuges. Before the deal, it was operating two times that many. Disabled Iran’s Arak plutonium reactor and modifies the reactor to keep Iran’s plutonium output at levels insufficient for a bomb. If Iran finished the Arak reactor as planned, it would have produced enough material for more than two weapons a year. Committed Iran to implement the Additional Protocol and additional safeguards, including continuous surveillance at key sites. Without the deal, Iran would have been free to continue installing more centrifuges and building up its stockpile of enriched uranium. The International Crisis Group calculated that without the deal, by 2017, Iran could have had around 20,000 IR-centrifuges at Natanz and rebuilt its stockpile of uranium enriched to 20 percent (eliminated under the interim deal and prohibited by the JCPOA) to 150 kilograms. That would put Iran days away from the enough material for one bomb by the end of 2017. If the United States pulls out of the agreement, that reduced breakout time could be a reality. Despite the success of nuclear deal, Iran’s ballistic missile program, which was not addressed by the JCPOA, remains controversial and a concern to U.S. policymakers. On June 28, Representatives Seth Moulton (D-Mass.) and Ruben Kihuen (D-Nev.) introduced a bill to extend presidential reporting requirements on Iran’s ballistic missile tests through 2022. The current requirement for notifying Congress of confirmed missile launches every quarter expires in 2019. Iran’s missile tests also came up again in the biannual UN secretary-general's report on Security Council Resolution 2231. In Resolution 2231, which endorsed the JCPOA, Iran is “called upon” not to “undertake any activity related to ballistic missiles designed to be nuclear capable.” Iran maintains that they never made the decision to pursue a nuclear weapon, and their ballistic missile tests are therefore not a violation of the resolution. The ambiguous language of Resolution 2231 has prevented the Security Council from achieving consensus on the matter and developing an appropriate response. Less vague is the resolution’s restriction on the import of illicit ballistic missile materials without prior permission from the Security Council. The U.S. has alleged that Iran violated this provision in October 2016 by receiving a shipment of ballistic missile-related materials, including carbon fiber. While the UN has not been able to corroborate the accusation, this potential infraction is troubling and should have consequences if confirmed. For a more detailed look at the June 2017 UN report on Resolution 2231, see the Arms Control Association’s analysis. At the same time, it is important for the United States to keep the threat of Iran’s missile program in perspective. According to a U.S. intelligence report released last month, Iran is not increasing the range of its missiles. The intelligence estimates a range of 2,000 km for Iran’s Shahab 3 medium-range missile, the same distance reported in the previous version of the study, published in 2013. While that earlier report suggested that Iran could field an ICBM by 2015, Iran has yet to test such a missile and the new report did not present a revised timeline for an ICBM. For years now, 2,000 km has remained the longest range within Iran’s missile arsenal. Further, by removing the threat of a nuclear-tipped missile, the Iran nuclear deal drastically reduces the danger these weapons pose. While Iran’s destabilizing activities are rightfully concerning, the United States has options to address them without undermining the JCPOA. Any attempt to abolish the nuclear deal risks dramatically worsening the security situation in an already fraught region. Through successful diplomacy, the Iran nuclear deal peacefully removed a significant threat to regional and global stability. On the second anniversary of its passing, it should be embraced, not abandoned. Find more details by reading the Arms Control Association’s coverage of the report. New U.S. Iran Sanctions Bill Stalled? The fate of the Iran sanctions bill (S 722), which passed the Senate in late June, remains uncertain as members of the House of Representatives differ over whether to move forward on the legislation. The Iran sanctions, however, are not the sticking point. The House of Representatives sent the bill back to the Senate over a constitutional concern that the legislation violated provisions requiring all revenue bills to originate the House. Despite a Senate fix, Republicans and Democrats disagree over the Russia sanctions provisions that were added to the bill on floor of the Senate. The White House also voiced concerns over the Russia provisions, saying the bill lacks flexibility in the waiver authority that the president may need to negotiate with Moscow. Iran continues to claim that the bill is an attempt to undermine the nuclear deal and officials say they will raise the issue at the regular meeting of the Joint Commission, the six-member body established by the JCPOA to review and resolve implementation and compliance issues, which will take place July 21. Iran joined 122 other non-nuclear weapons states Friday, July 7, to adopt a new global Treaty on the Prohibition of Nuclear Weapons. Under the agreement states-parties are prohibited to use, threaten to use, develop, produce, manufacture, acquire, possess, stockpile, transfer, station and install nuclear weapons or assist with any prohibited activities. The treaty also outlines obligations to assist victims of nuclear weapons use and testing and it sets out a pathway for nuclear-armed states to verifiably and irreversibly disarm and join the treaty. Iran’s ambassador to the International Atomic Energy Agency, Reza Najafi said that Iran “strongly supports the objective of the treaty that bans possessing, using or threatening to use nuclear weapons in the world,” and highlighted a religious decree issued by Iran’s Supreme Leader, Ayatollah Seyyed Ali Khamenei, which considers any use of nuclear arms as forbidden. The initiative was primarily motivated by non-nuclear weapon states’ growing frustration with the inability of the nuclear-weapon states to fulfill their own nuclear disarmament commitments made in the context of the Nuclear Nonproliferation Treaty (NPT) and growing concern about the risk of nuclear weapons use. None of the world’s nine nuclear-armed states participated in the negotiations. While the new treaty will not immediately eliminate any nuclear weapons, treaty proponents argue that it can also serve to further delegitimize nuclear weapons and strengthen the legal and political norm against their use. The new treaty will be opened for signature beginning Sept. 20 and it requires 50 states to ratify before it enters into force.